The Mid Sussex Brass Band was formed in May 1986 following the amalgamation of the Haywards Heath Town Band and the Burgess Hill Brass Band. This move was necessitated by dwindling numbers of personnel in both bands and enabled the creation of a stronger band that could continue to maintain the busy programme of engagements and competitions that both bands had undertaken in the past. 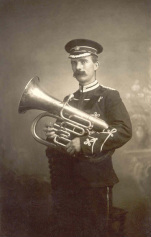 Like many brass bands, the Mid Sussex Brass Band can trace its origins to the late 19th Century. In the late 1800s, George Hilton, furniture store manager and a member of the Brotherhood Chapel (later to become the Methodist Church) in Haywards Heath, gathered a group of reed and brass musicians and called it the 'Brotherhood Band'. The band practised behind the chapel and was financed by Mr Hilton, who purchased both instruments and uniforms. 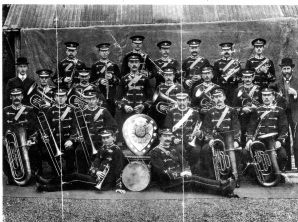 The group disbanded at the outbreak of the First World War, but was reformed in 1922, without the reed section, as the Haywards Heath Town Prize Silver Band. The Burgess Hill Brass Band has a history traceable to as far back as 1932, but it is understood that that there was a brass band presence in the town for many years before this date with musicians gathering to play at local events from as early as 1890. The Haywards Heath Town Prize Silver Band played on successfully until the mid-1960s when support rapidly dwindled. At a time when there were no more than ten regular players, the band even wrote the the Mid Sussex Times begging for help because of a lack of both cash and young players. Lawrence Burtenshaw, a local JP and Bugle player with the Royal Marines Band, read the letter and offered his services; the band's committee nominated him as Band Sectretary. Mr Burtenshaw worked hard to rebuild the band, visiting local schools to recruit new players whom he and other band members taught to play. Within two years the band had nearly thirty playing members, a remarkable achievement, and had moved to a new rehearsal venue in the Council Chambers in Haywards Heath. The band began to take part in regional contests under the baton of Ron Atkin and enjoyed some success. Sadly, four years after becoming Band Secretary, Lawrence Burtenshaw suffered a stroke and was unable to continue in the role. A regular engagement for the band was playing for home matches and Brighton and Hove Albion's Goldstone ground. As the band marched around the pitch coins would be thrown by the crowd into a large blanket carried by band supporters; this later had to be stopped following injuries to band members and supporters sustaining injuries from enthusiastically thrown coins! During the late 1970s the Burgess Hill Brass Band was active in the local community and enjoyed much success in regional contests under the baton of Musical Director Arthur Chapman. In the early 1980s a number of players left the band to reform the then defunct Handcross Band and the fortunes of Burgess Hill Brass Band fell for several years. In 1978 Paul Homewood became Band Secretary at Haywards Heath. At this time the band was renamed the Haywards Heath Town Band; new uniforms were purchased and many instruments were replaced. Tony Cripps became Musical Director of the band in 1979. Unfortunately, support for the band again dwindled over the next few years. In 1986 the Haywards Heath Town Band and the Burgess Hill Brass Band merged and became known as the Mid Sussex Brass Band. The newly-formed band attracted new players and in 1989, under Musical Director Arthur Chapman, the band qualified for the finals of the National Brass Band Championship. There was further contest success in local contests under the baton of John Williams. In 1999, one of band's more notable performances was playing for the Queen and Duke of Edinburgh's visit to Burgess Hill to open The Triangle Leisure Centre. The Mid Sussex Brass Band (MSBB) continues to rehearse in Burgess Hill, and a number of players from the old Haywards Heath Town Band and Burgess Hill Brass Band still play regularly with the band. In common with many brass bands in the south of England, it has had its ups and downs over the years but has nonetheless continued to perform across West Sussex and further afield. MSBB can frequently be heard playing at fetes and other events, and also at bandstands in Horsham and Eastbourne. In its home town, the band plays twice-yearly concerts in the Martletts Hall, Burgess Hill, one as a part of the Burgess Hill Festival, the other a Christmas concert; it also leads the Burgess Hill Remembrance Day Parade. MSBB has enjoyed success in the regional brass band contests organised by the Southern Counties Amateur Bands Association (SCABA), both as a full band and with smaller ensembles and quartets. These successes have been achieved under the baton of successive Musical Directors including Andy Wooler, David Hughes, Dan Hunt and present Musical Director Steve Winter. The band secured third place at both the Spring Contest in Hove in 2010 and in the 'B Ensemble' section at the Ringmer Ensemble and Quartet Contest in 2011. MSBB does not currently take part in full band contests but remains registered with SCABA in the 3rd Section. Every two years since 2002 the Senior Band and guest players have packed up their instruments and music and boarded a coach bound for Burgess Hill's twin town of Schmallenberg in Germany. The band takes part in the Schmallenberger Woche, the town's festival of music and cultureand performs at a variety of venues in the town, including a local factory on on the main stage in the town square. A highlight of the trip is a joint concert with the Oberkirchen-Nordenau Band, with whom MSBB now has a firm friendship. At the 2010 concert, MSBB was introduced as "the best band in Britain", an accolade that may have been reassessed following the visit of the Black Dyke Mills Band a few weeks later! MSBB is pleased to incorporate a thriving Youth Band under the leadership of Trombone player Peter Mansfield. The Youth Band has successfully nurtured and developed young players, a number of whom have progressed to the Senior Band where they make an invaluable contribution. The Mid Sussex Brass Band is a self-supporting organisation, funded by the subscriptions of members and from performance fees.